You will fall in love with these bread-adoring dogs. We found your new favorite Instagram account: @saddogsoffireisland. Fire Island Rustic Bakeshop, a Jewish-owned bakery in Anchorage, Alaska, is not just a high level bakery, but a gathering place for community members. And a lot of people use the bakeshop as a destination for their family bike rides and walks with their dogs. But, in accordance with health regulations, dogs are not allowed inside the bakery. 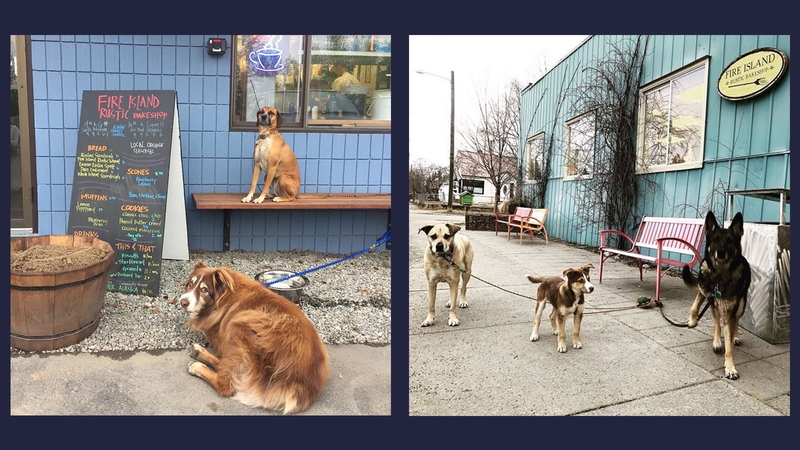 As people go inside to purchase bread or other delicious pastries, they have to leave their dogs outside. And those dogs are very, very sad to be missing out on the deliciousness. This Instagram account’s first post, from October 2014, shows a yellow lab sitting mournfully outside the bakery door. Fire Island has been around since 2009, founded by wife-and-husband team Janis Fleischman and Jerry Lewanski, and are gearing up to open their third location this coming week. They hired their daughter and son-in-law as their first bakers nine years ago and have been training them to take over the bakery. As Bon Appétit wrote, “Fire Island is an altar to bread, with classics like Alaska whole wheat and Fire Island sourdough turned out daily and specials like challah, plum flax, and sprouted grain offered on specific weekdays. It takes about .01 seconds inside the bakery to understand just how seriously these people take bread.” And they are not just serious about their bread, they have their own urban garden and use all their own greens at the bakeshop. They also churn out challah and matzah ball soup on Fridays with other Jewish favorites like hamantaschen for Purim and flourless desserts for Passover. Your next vacation has got to include this delicious bakery, and these adorable (sad) dogs. There is exciting new Jewish food from coast to coast. The cutest dogs with the most delicious names.